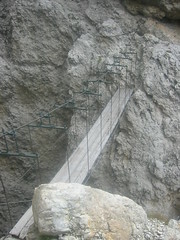 Trip to the Dolomites to discover Via Ferrata with Annette and Thomas. Up at 7:30, up to Haus Valentin for breakfast and pick up a packed lunch. 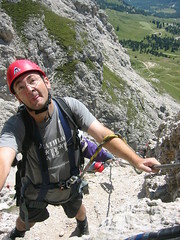 Pick up the Via Ferrata gear in Pedraces and then head over to Corvara. Meet Jes and Ben. Drive up to the Pass Gardena and park there. Do the Piz da Cir. A little anxiety at the start but both Annette and Thomas do very well and enjoy it. We all climb to the summit at 2500m. 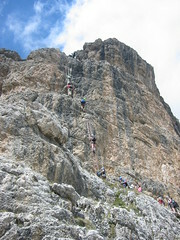 Down a scree slope to the Rifugio. Thomas talks with Jes a lot. Have a beer there and eat the sandwiches on the piste. Back to the car and drive to Pedraces. Thomas reads his Harry Potter and we do a little shopping and then end up driving round the four passes, i.e. Campolongo, Pordoi, Sella and Gardena, very spectacular. Eat at the Nagler again and then a last one in Valentin, have to bang on the door again to get in. All very tired. Decide to do Tridentina tomorrow. We all have a bit of a lie in till 9am. Annette does breakfast in the apartment, bread, eggs, Coco Pops etc. Drive to Corvara to look for a map but cannot find one. Drive up towards Pass Gardena, see the bridge at the top of the Torre Exner. Start walking at 11:15am. The first section is pretty steep with stemples. Half way up there are two large claps of thunder and a little rain. Get to the top and it has cleared up so decide to go on. Get to the bottom of the main section at 12:15. One Italian family with a small girl are ahead of us. It takes us a long time to get up the right hand side of the waterfall. It rains hard as we get to the top of the main section. 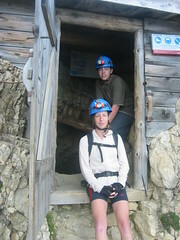 Annette and Thomas have had enough and go straight to the Rifugio Cavazza. I carry on up the main section, very steep, get to the bridge very shortly. Get to the Rifugio at 15:15 just as the rain gets very heavy. Have goulash soup and watch the rain and thunderstorm, stay for 1� hours, until the sun starts shinning. Head down route 666, north from the Rifugio, down some very easy VF. At the end of the VF I fail to see the start of the path. We end up on the end of a promontory above some cliffs. Get back on track and back to the car for 19:10. Showers and then up to Valentin. Dorothy plans us a couple of days out routes staying in Rifugios. Eat our sandwiches back in the apartment. Decide on a bit of a rest day tomorrow. Annette goes into Pedraces to get bread, etc Fantastic weather. Phil phones to say that both the Rifugios are full, we all go up the Valentin to make some more plans. Thomas reads Harry Potter all day. Annette and I decide to go to the Lagazuoi tunnels, however get part way there and the Valparola pass is shut. Turn round and head back to Valentin, have a drink outside and enjoy the views. 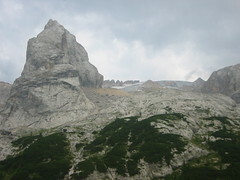 After some debate Annette and I drive round to the Pordoi cable car and go up to the car, interesting to see the top of Sella, but not enough time to go anywhere. Continue round the four passes route and stop for a beer in Arabba, very slow service in the Table bar. Buy three sets of VF gloves in Corvara. Back for 19:30, get changed and walk down to the restaurant, I have goulash and Annette and Thomas have steak. Back for a late drink to the Valentin bar and book in for Piz de Lech tomorrow. Pack everything into the car. Pay the bill at Valentin and away by 9am. Phil worries that they will go without us. Get to Corvara for 9:15, we are the only guests doing the VF, Cat and Ben are with us. Walk to the bottom of the cable car and go up. Carry on up the Vallon chairlift to the start of the Piz de Lech route. We all wear our new matching VF gloves. The route is fairly busy and we have to queue a little. We all try to climb on the rocks and not pull up too much on the wire. Ben helps Thomas to find footholds etc. Annette climbs at the front with Cat. Go up two long ladders, I have to wait half way up. I am surprised when they tell us that this is the last section. The top of the ladders is a tricky move. Walk along the ridge to the summit for lunch. Great views down to Corvara and the Rifugio Cavazza at the top of the Tridentina route. Easy walk down to the top of the cable car for beer. 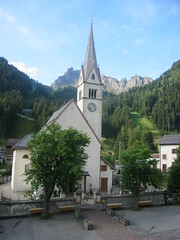 Good views across to Civetta and Pulmo. Go down on the cable car. I am fading fast and we have to go for ice cream and coffee. Drive over to Arabba and check into the apartment above Caf� Peter. Go to the 7 Sass pizza place, very good, me and Thomas have the Anti-Doping special. Drive up to Pass Falzarego. Hire helmets and head torches at the bottom and go up the Lagazuoi cable car. Head into the first tunnel, it is full of people, Annette decides to stay at the top. I head down a little further and then just keep on going further downhill. Go along the Martini Ledge, very interesting. The walk back up the tunnel is quite tough. Annette and Thomas are waiting for me at the top, have a quick drink. Drive back to Arabba, Me and Annette go for a walk in the woods and go round the exercise route there. Have spaghetti carbonara and pork chop in the Table bar. At the end of the meal we get totally overrun with flies and have to return to the apartment. I get some VF gear from Mode Sport. Annette gets bread, etc. The car has been roped off because of the arrival of some local dignitary. Drive over the Pass Falzarego, the Pass Valparola is still shut with a landslide. Down into Cortina, very heavy rain on the way there. We were planning to do a VF near Cresta Bianca, but decide not too. Park near the Olympic ice stadium and have a wander round the town, have a coffee and go round the church. Drive on over the Pass Giau. Stop and look up at the Rifugio Nuvolau. It looks fantastic, consider walking up. 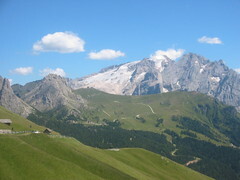 Carry on and drive over the Pass Fed�ia, great views of the glacier coming off Marmolada. Weather improves and we drive to Sottoguda. Me and Annette walk up the gorge, heavy rain when we get to the top. Eat in the 7 Sass again, very good. A U2 tribute band, velvet dress, are playing in the square, we have to stop and listen and drink more beer. Leave Arabba at about 9am. Drive to Milano and catch the flight back.